Milo and Maggie are one of those brother and sister pairs who put the fun in dysFUNctional. 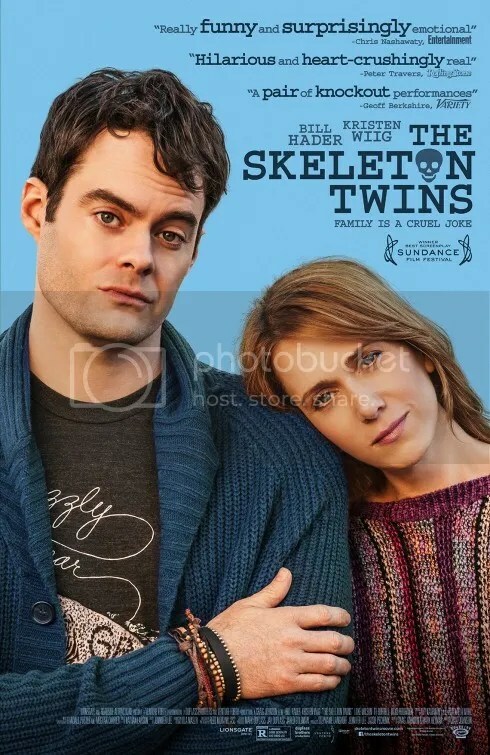 The Skeleton Twins are so named because of a couple of toy skeletons their father handed them on Halloween when they were kids. The thirty-somethings have been living angst-ridden lives set adrift since the death of their father many years ago. A strange twist of fate unites the two after a decade of estrangement. A despondent Maggie is contemplating a handful of pills in her hand when the phone rings. “How did you get this number? I’m on the National Do Not Call Registry!” without realizing the severity of the message. It’s the hospital. Her brother has unsuccessfully tried to commit suicide and he is currently under their care. The perfect timing means her own suicide will go unsuccessful as well. Look beneath that dark surface and there is an ironic glimmer of hope. There’s humor too. The Skeleton Twins is a movie that touches on pain, but it’s also about that silver lining. Newbie director Craig Johnson co-wrote the brilliant script with Mark Heyman (Black Swan). Their screenplay snagged the prestigious Waldo Salt screenwriting award at the 2014 Sundance Film Festival in January. But their words would be nothing without the stellar talents of Bill Hader and Kristen Wiig. They’re at the core of this trenchant drama giving a pair of extraordinary performances. Hader and Wiig are Saturday Night Live alums who started together in the program’s 2005-06 season. They have genuine chemistry displaying a beguiling closeness in their interactions. They are every bit as believable as twin siblings. This could’ve been “The Stefon and Gilly Show” based on their popular sketch characters but they rein in their frenzied tendencies. Both actors’ portrayals are among the best of the year. Additionally it’s worth mentioning Ty Burrell and Luke Wilson who epitomize crucial supporting roles that are just as beautifully acted as they are written. The Skeleton Twins deftly blends savage drama with honest laughs. It’s kind of an odd mix, but stars Kristen Wiig and Bill Hader’s easygoing familiarity is mixed with such sarcasm, that the irregular tonal shifts work. The highlights of the film are scenes where they just play off one another as a finely tuned comedy machine. Hader’s invitation to Wiig to lip-sync Starship’s “Nothing’s Gonna Stop Us Now” could’ve come across as supremely cloying. But his exaggerated theatrics and amusing gestures to the music are so dead-on that they almost parody the song. The vignette is so infectious that you can’t help but want to join in. The tune was first featured as the theme to the 1987 hit Mannequin. I will no longer associate the upbeat anthem with that romantic comedy anymore. Wiig ultimately succumbs to his charms no matter how hard she tries to resist. We the audience likewise do the same. This entry was posted on September 20, 2014 at 10:16 pm and is filed under Comedy, Drama with tags 2014. You can follow any responses to this entry through the RSS 2.0 feed. You can leave a response, or trackback from your own site. Great review! Really want to see this one. Huge fan of Hader and especially Wiig. I know you’re gonna enjoy this, Fernando. I feel 100% confident in recommending it to you without any reservations. Looking very much forward to seeing Hader and Wiig dialing back their silliness a tad for some heavier drama — and when u say they are among the best of the year so far, that’s just. . .wow. Can’t wait! Wondering how long that’s going to be, too. . . I get so frustrated at limited releases. I am really starting to respond to TV On-Demand. Such a great way to see those films not available in wide release. Very good and well acted movie. Wiig and Hader had the perfect chemistry together. Story was very deep and emotional. 4 1/2 stars. This just might make my Top 10 of the year. It was that good. I really want to see this movie. The trailer looks very promising. I like Kirsten Wiig from “Bridesmaids” (yes, I acknowledge this is not the same kind of movie,) but I don’t think I’ve seen Bill Hader in anything except Lonely Island SNL. His character is gay, isn’t he? Not that his character’s sexual orientation means that much to me, that was just the impression I got from the theatrical trailer. I have a history of suicidal behavior but I will not be triggered by this movie because I am doing much better. Glad to hear that you enjoyed Skeleton Twins. I’ve been hearing a lot of buzz about the strong performances by Hader and Wiig, but from what you’re saying it sounds like everyone does a great job, even supporting characters. It’s really impressive when a film can balance serious drama with laughs in the way you’re describing. I love movies that can do that. I just got a screener of Skeleton Twins in the mail and I can’t wait to watch it! Hopefully I’ll enjoy it as much as you did. Yes I got that too, along with A Most Wanted Man and The Homesman.